This was a prebooked commission and is the second commission in a series of books by C. A. Szarek. The first one was ‘Sword’s Call’ (Click on the image below to see the full painting). I took some notes & a lot of screenshots while painting this piece, so be prepared for rambles and rough drawings! Anyway, this is the rough design for Love’s Call. 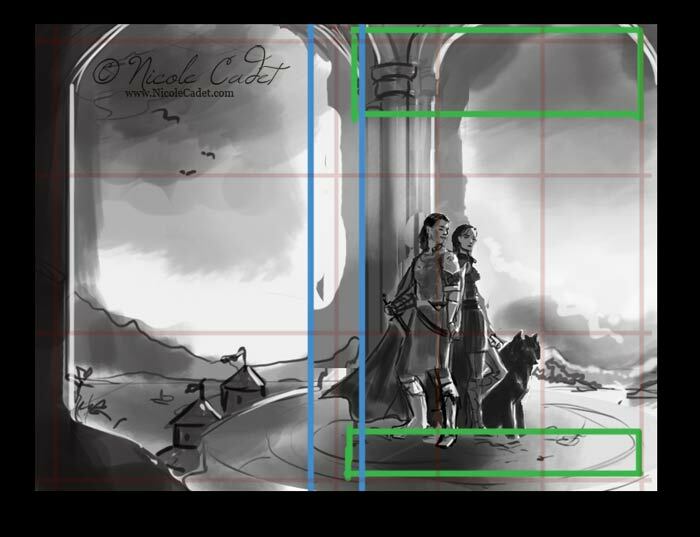 I’ve got some changes to make when I do the line-art – this is the thumbnail sketch with some of my composition notes. I only gave the client 3 sketches with the same poses on all three. Normally I try and give a bit of variety, but I spent about a week just trying to figure out a pose that worked. The character relationships in a pose needed to be believable, I had reference for, and was a mix of romance and fantasy. I think I must have gone through about 20 combinations before settling on this one. I always start with a bit of bleed for the edges and split the image in 2 (for the spine). I’ll check the rule of thirds across the image, but the most important place for it is the cover (the back is covered by words). The last cover I had no idea where they’d put the text, what font they’d use, how big it would be, nada. I’m leaving more space up top this time so it doesn’t matter too much where the text goes. Looks like I’m taking the easy way out with so much sky, but makes the text more easy to read in my opinion. Working to Golden Mean for the Front cover. N.B. There was an extra layer I played with where the column was wider which is why the sky does not go all the way to the post. I may move the post over. I roughly worked out spine and text locations. Could have drawn in the back cover blurb as well. I’m assuming they’ll want continuity with the layout). I checked the perspective, but only after I’d drawn the characters on a separate layer. The characters took about a day just to work out roughly what I though the costumes might be like, the pose for the man (as he’s frankensteined from about 3 or 4 references, and when I go in for his face, there will be more for his hair and other details like that). If I have a structure and lighting to start with, it’s generally not too hard to make a person look slightly different… you just hollow out the cheeks a bit more, make the jawline a bit stronger, straighten the nose, make the brows heavier etc. I think technically the perspective of the background is actually wrong, we should be looking up at them, again, I’ll work it out. The final check was to see the flow of the eye. There will be some things I need to make sure I capture such as the area the wolf is looking at, to make sure it doesn’t go off the page etc. Planning on having lots of kind of curved and V movements.Anyway, look out for the next post where I go though colour roughs and possibly the line art.